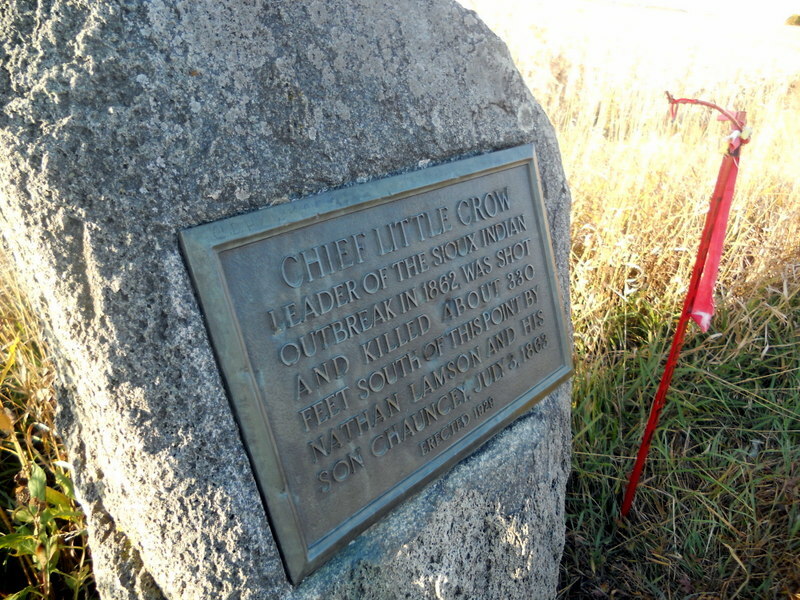 Two roadside memorials point to the place in Meeker County, Minnesota, where Nathan Lamson shot Little Crow on July 3, 1863. “Mrs. Mary Elizabeth Lamson, 1011 Sixth street southeast [Minneapolis? ], a daughter of Mr. Lamson, was a child of five at the time of the shooting and recalls many of the events of those exciting days. “My father owned a farm about two and one-half miles from Hutchinson in the direction of Lake Belden, but we had abandoned the farm and were in Hutchinson with other settlers for protection against Indian attacks,” said Mrs. Lamson of the shooting of Little Crow. “Our temporary home within the stockade consisted of a covering of poplar poles with hay, and blankets spread over brush to form a place to sleep. So many families had fled to Hutchinson in haste without bringing food with them that the supply was short and I can remember crying myself to sleep because of hunger and dread of Indians. I can recall seeing the Cross family, the mother and two little children* who had been murdered within a hundred yards of the stockade. In some way I eluded my father and went over to see them. They had not been scalped, simply chopped with an ax and I never forgot that awful sight. On the third of July  my father and brother Chauncey left Hutchinson to look after the stock which had been [clipping fragment missing]…. old fashioned muzzle-loading rifles so common in those days. The men separated, one going into the brush at either side of the roadway. Little Crow and his son, the Appearing One, had been picking berries and saw my father and brother at the moment they were discovered. Both parties fired at the same time. None of the shots took effect and my father reloaded. At his second shot, he saw one of the Indians leap to his feet, cry out and fall forward. A second shot from one of the Indians wounded my father in the shoulder as he crouched in the bushes. The ball plowed a furrow about six inches in length across his left shoulder and caused him great difficulty in reloading his rifle. Nathan Lamson crouched near the spot where he had entered the timber afraid to move because he feared there might be other Indians nearby. Chauncey crawled away after the second exchange of shots and returned to the stockade in Hutchinson about eleven o’clock that night. My father remained on the scene of the shooting until morning. “Where’s my papa?” I demanded when Chauncey returned. My mother fainted when my brother returned alone and I recall begging the rough old doctor who was attending her not to let my mother die. At daylight my father returned to the stockade and a few hours afterward, Albert, my youngest brother, was born in the rude shelter of poplar poles we called home. Soon after my father came in, bleeding and tired, the mounted soldiers from the fort lined up to go after the body of the Indian. I remember that an older brother of mine was second from the captain as they set out. When they returned they had the body of Little Crow on a blanket in the bottom of a wagon. With other children, I climbed up on the wheel of the wagon to see the Indian. “Oh, look at the Indian my father shot,” I cried. The body of Little Crow was placed near McGraw’s store where all the village might see it. He had been shot through the stomach. Of this I am certain for I heard my father repeat it many times. There was no wound or bullet hole in his head. The body of Little Crow was buried near Hutchinson and I recall the men of the town starting out for this task. Years afterward Governor Merriam requested the guns of my father and Little Crow be sent down to St. Paul. Little Crow had a double-barreled shot gun, which is now in the possession of a brother of mine living in British Columbia. My father was particularly bitter against the Sioux for a half-sister of mine, Harriet Adams, had been captured by a party of them and kept captive twenty-one days [fragment missing]…. Her young baby was [killed by] the brutes. [Fragment missing.] …ways promised me Little Crow’s beaded moccasins which he took from the body, but these were lost…. I’ve never before heard that captive Harriet Adams was Nathan Lamson’s daughter and that her dead baby was Lamson’s grandchild. I’ll be updating the text of this post to fill in the missing text when I have a chance to look up the microfilm and to follow the internal clues that the story was probably reprinted from the Minneapolis Tribune. *Note on the “Cross family:” When I could not find any mother and two children surnamed “Cross” among the known dead in Meeker County, I checked with Curt Dahlin, who currently maintains the most comprehensive lists of identified dead. Curt suggests the description matches Mrs. Spaud and her children. Source: “Anniversary of the Hanging Thirty-Eight Sioux Indians –Daughter of Nathan Lamson of Minneapolis Recalls Stirring Pioneer Days –Slaying of Little Crow is Described By Mill City Woman” Mankato Free Press, December 27, 1913. Clipping from the Executions subject file at the Blue Earth County Historical Society. Photo: Carrie Reber Zeman October 3, 2011. The marker which today is scarred with dents from modern bullets, is located one half mile south of Highway 15 on County Road 18 in Meeker County, MN. This entry was posted in Little Crow. Bookmark the permalink. Reading accounts like this, of personal remembrance, bring the incidents to life. The description of life inside the stockade, with shelters made of poplar poles, and a baby being born there, bring insights into what some of the refugees were experiencing. I agree that this helps bring the story to life. However, I’m not familiar with the “rules” of historical research. What sort of credence/impact does an account like this have? On one hand, she was actually there and at an impressionable age, so she may remember well. On the other, events often develop into family legend, and this was written fifty years afterwards. How would you go about verifying which memories are accurate and which aren’t? Great question, Katie! The answer is worthy of a post of its own and I will tackle it soon! I found Nathan Lamson’s grave site in Champlin,Minnesota. Was he a friend of the Ed Hadley family in Champlin? I haven’t researched the end of Lamson’s life. Is Hadley a relative of yours? If you decide to look into it and you find anything, please let me know! What was your great-grandmother’s name? A friend of mine says her great grandfather, John Benjamin, was the doctor in Hutchinson at the time of the Conflict and the death of Little Crow. In 1862 Dr. Benjamin was 39 years old, so I don’t know if he is the “rough old doctor” quoted in the Lamson account or not. A story carried down through my friend’s Benjamin family says Dr. John Benjamin was a friend of Little Crow, and was the person who rescued Little Crow’s body after it was brought into Hutchinson and was being desecrated by the townspeople. Thanks for adding that story to the collection. Dr. John Benjamin’s name is familiar to me, although I can’t place him at the moment. I’ll let you know if I find him. My wife’s Great Grand father was Fred C. Grose. Fred married Wihelmina Zitzlaff after she was rescued from the Dakota Indians. Her family never knew about this story until I came across it last week. We have a picture of Fred Grose with his birthday and death dates on it. Her dad was 9 when his father died. He said he had little contact with his father Joseph Daniel Grose. Mary Lamson was married to my Great Great Grampa, George Senear. She was not ‘Mrs. Mary Lamson. Regarding doubting old accounts, all testimony is open to question as different accounts of the same incident can widely vary. And the reports written by army officers after attacks on Indian villages never reveal the number of women and children killed. These facts come to light with personal letters written by common soldiers after the event. Mary Lamson’s account can’t be dismissed as it ties in with the known facts. – Paul Williams, author of “Frontier Forts Under Fire” and other books dealing with the American West. Thanks, Paul. I don’t doubt it! I agree. Often new information comes to light when we search out and compile the stories of eye-witnesses. We are all richer for what primary sources have to share. Hi Carrie. I’ve just been researching the Dakota War and following punitive expeditions for a new book on the topic, to be published by McFarland. As they’ve just accepted the manuscript I don’t yet know when or what the final title will be – they always insist on choosing that. Thanks for your contribution, as I’m quoting from Mary’s account, and will credit your website in the bibliography.